108 m a s s a g e & b o d y w o r k n o v e m b e r / d e c e m b e r 2 0 1 8 Contact Angie Parris-Raney at 800-458-2267, ext. 1641, or angie@abmp.com for more advertising information. 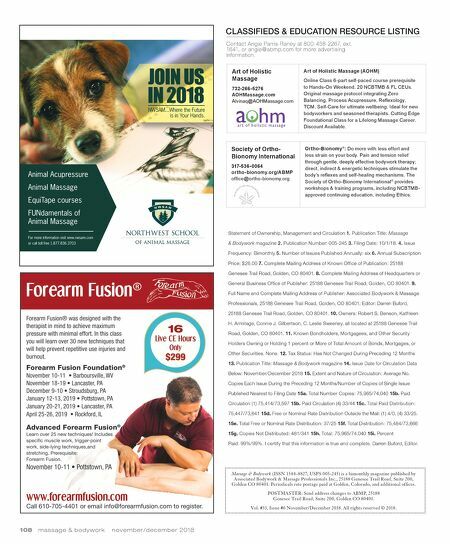 Massage & Bodywork (ISSN 1544-8827; USPS 005-245) is a bimonthly magazine published by Associated Bodywork & Massage Professionals Inc., 25188 Genesee Trail Road, Suite 200, Golden CO 80401. Periodicals rate postage paid at Golden, Colorado, and additional offi ces. POSTMASTER: Send address changes to ABMP, 25188 Genesee Trail Road, Suite 200, Golden CO 80401. Vol. #33, Issue #6 November/December 2018. All rights reserved © 2018. Art of Holistic Massage 732-266-5276 AOHMassage.com Alvinaq@AOHMassage.com Art of Holistic Massage (AOHM) Online Class 6-part self-paced course prerequisite to Hands-On Weekend. 20 NCBTMB & FL CEUs. Original massage protocol integrating Zero Balancing, Process Acupressure, Refl exology, TCM, Self-Care for ultimate wellbeing. Ideal for new bodyworkers and seasoned therapists. Cutting Edge Foundational Class for a Lifelong Massage Career. Discount Available. CLASSIFIEDS & EDUCATION RESOURCE LISTING Society of Ortho- Bionomy International 317-536-0064 ortho-bionomy.org/ABMP offi ce@ortho-bionomy.org Ortho-Bionomy ® : Do more with less effort and less strain on your body. Pain and tension relief through gentle, deeply effective bodywork therapy; direct, indirect & energetic techniques stimulate the body's refl exes and self-healing mechanisms. The Society of Ortho-Bionomy International ® provides workshops & training programs, including NCBTMB- approved continuing education, including Ethics. Statement of Ownership, Management and Circulation 1. Publication Title: Massage & Bodywork magazine 2. Publication Number: 005-245 3. Filing Date: 10/1/18. 4. Issue Frequency: Bimonthly 5. Number of Issues Published Annually: six 6. Annual Subscription Price: $26.00 7. Complete Mailing Address of Known Office of Publication: 25188 Genesee Trail Road, Golden, CO 80401. 8. Complete Mailing Address of Headquarters or General Business Office of Publisher: 25188 Genesee Trail Road, Golden, CO 80401. 9. 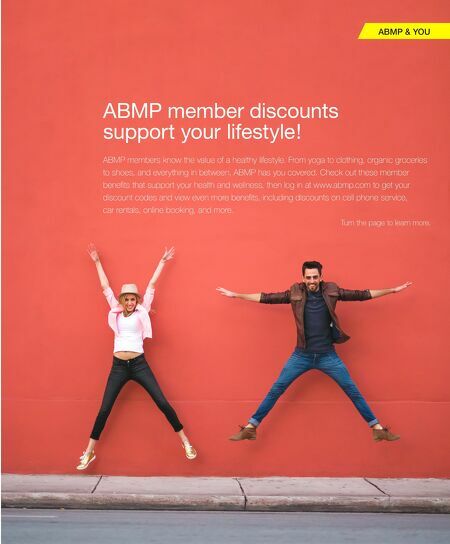 Full Name and Complete Mailing Address of Publisher: Associated Bodywork & Massage Professionals, 25188 Genesee Trail Road, Golden, CO 80401; Editor: Darren Buford, 25188 Genesee Trail Road, Golden, CO 80401. 10. Owners: Robert S. Benson, Kathleen H. Armitage, Connie J. Gilbertson, C. Leslie Sweeney, all located at 25188 Genesee Trail Road, Golden, CO 80401. 11. Known Bondholders, Mortgagees, and Other Security Holders Owning or Holding 1 percent or More of Total Amount of Bonds, Mortgages, or Other Securities. None. 12. Tax Status: Has Not Changed During Preceding 12 Months 13. Publication Title: Massage & Bodywork magazine 14. Issue Date for Circulation Data Below: November/December 2018 15. Extent and Nature of Circulation: Average No. Copies Each Issue During the Preceding 12 Months/Number of Copies of Single Issue Published Nearest to Filing Date 15a. Total Number Copies: 75,965/74,040 15b. Paid Circulation (1) 75,414/73,597 15b. Paid Circulation (4) 33/44 15c. Total Paid Distribution: 75,447/73,641 15d. Free or Nominal Rate Distribution Outside the Mail: (1) 4/0, (4) 33/25. 15e. Total Free or Nominal Rate Distribution: 37/25 15f. Total Distribution: 75,484/73,666 15g. Copies Not Distributed: 481/341 15h. Total: 75,965/74,040 15i. Percent Paid: 99%/99%. I certify that this information is true and complete. Darren Buford, Editor.